On November 21, Bill 47 was enshrined in provincial law. The much-maligned bill eliminates a bevy of provisions passed under the preceding government’s Bill 148, the Fair Workplaces, Better Jobs Act. The crux of the controversy surrounding the bill is that it freezes the minimum wage at a substantial $14 an hour, instead of the previously planned $15 an hour. Many progressives, including students, have voiced their concern over the bill. But given the state of the economy following Kathleen Wynne’s tutelage, this freeze is Doug Ford’s best option and the right path forward for Ontario. As pure as the intentions may be in advocating for higher wages vis-à-vis government mandates, it is not possible to legislate away poverty. Economic intrusions like artificial wage hikes always come prepackaged with unintended consequences. At the end of the day, one individual’s wage is another person’s cost. Employment is the voluntary contract between those two individuals. The agreed upon wage is ordinarily set by basic market forces: supply and demand. Efforts by government to intervene in this contract cannot benefit the employee without affecting the employer. As also noted by BMO Capital Markets’ senior economist, Robert Kavcic, the restaurant price hikes were a direct result of the Liberal government’s policy. In the same period that saw the province’s minimum wage jump 21 per cent, Ontario’s restaurant prices grew at a faster rate than any other province in the country. Restaurants weren’t the only industry to feel the economic ripples of Wynne’s progressive proclivities. The Canadian grocery conglomerate Metro estimated its costs incurred from the wage hike to exceed $40 million. As a result, the firm said that it plans on cutting staff hours, in addition to reducing the number of 24 hour stores in the GTA. The service sector also felt the pinch of rising costs. In Collingwood, Little People’s Daycare closed its doors permanently, citing the steep and swift spike in minimum wage. In George Lucas’s original Star Wars trilogy, fans were immersed in a vast and uncharted universe rife with relics of the late Jedi order. The first film, “A New Hope,” introduced and set the stage for the main protagonists and antagonists with drips of detail to induce intrigue and wonder in the audience. Following sequels provided sustenance for fans’ fervor, delving deeper into the characters and connecting storylines. With 2015’s “The Force Awakens,” Disney played it safe. Director JJ Abrams effectively stuck to the same script (almost literally) as “A New Hope,” and the film was highly enjoyable – discounting its lack of original storytelling, and the fact that our hero Luke Skywalker had been reduced to retirement in what could only be described as the Florida of the vast Star Wars universe. Now on to “Episode VIII: The Last Jedi.” Before I go any further, the review will contain major spoilers. There was a slew of weaknesses in the plot (and this is aside from the fact that the movie felt drudgingly dragged out at times) that can’t be pointed out without giving anything away. But don’t be disparaged, I’m saving you from having to sit through a 152-minute long mess. The topic of net neutrality is one of the hottest debated issues of the modern day, and for good reason. We all use the internet and thus have a natural tendency to weigh in on issues regarding its regulation. The internet, however, is a complex hierarchical structure riddled with reams of vagaries. Without first understanding them, people shouldn’t attempt to propose legislation. Unfortunately, from Congressmen to commentators to comedians, this is exactly what we’ve been seeing regarding net neutrality. The only hot political issue where coverage is comparably poor is that of firearms. In fact, USA Today and Vox.com tweeting out explainers on the civilian AR-15 with a chainsaw and grenade launcher attached to it is the perfect analogy for how net neutrality is covered in the media. But before getting to net neutrality, there are some key concepts about how the internet works that need explaining. The internet is best described as a “network of networks.” It’s divided into regions that perform different functions. Access to the internet is provided through an Internet Service Provider (ISP). The ISP you’re probably most familiar with is the one you pay directly for your home internet (for example AT&T, Verizon, or Bell Canada). These providers are known as Tier 3 providers. But ISPs do a lot more than simply sell you a home internet plan. There are also Tier 1, and Tier 2 internet service providers. Here’s a rough sketch of the interconnected web in the United States. Tier 1 ISPs are known as the backbone of the internet. There exist about a dozen of them around the world, and they peer with one another, thus not having to pay anyone for transit (they have no providers). Tier 1 networks can reach every other network on the internet. Next on the internet hierarchy are Tier 2 ISPs. These are effectively a bridge between the Tier 1 internet backbone, and the Tier 3 access ISPs end users use to connect to the internet. And finally, between all of these, we have Internet Exchange Points (IXPs). This is a large, physical exchange point where data is exchanged between peers. For a closer look at the function these exchange points serve, here’s a second diagram. In the above diagram, Internet Service Provider (ISP) A, B, and D are all transit networks. With reference to the above diagram, these can either be Tier 1 or Tier 2 networks. For example, AT&T, or Verizon Enterprise Solutions. Lastly, on this diagram, we have two internet exchange points. Recall in the first diagram, we saw these connected IXP points between networks. 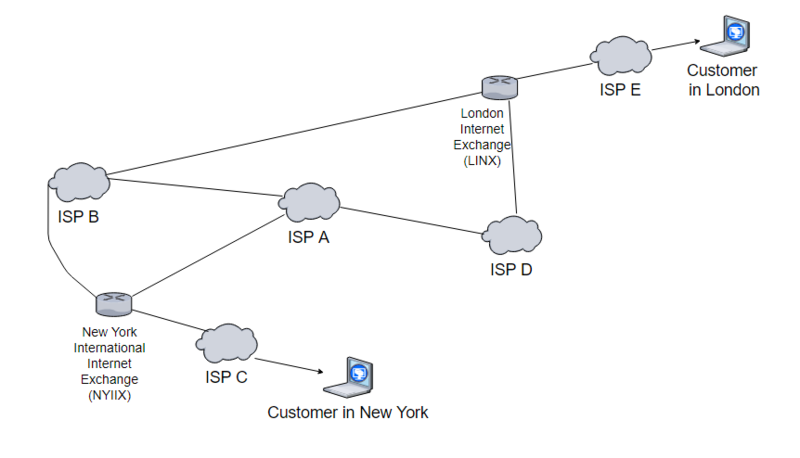 (1) The New York International Internet Exchange (NYIIX) and (2) the London Internet Exchange (LIIX). These are two of the many internet exchange points that exist around the world. These physical locations are large hubs where independent networks exchange traffic with one another. Traditionally, if Google wanted access to the global internet to deliver its content to you (an end user) it would go to an ISP, and become its customer. The ISP would, in turn, provide transit to Google. On Tuesday, Ontario’s provincial government, undeterred by the province’s title-claim to the world’s most indebted sub-sovereign borrower (one-third the population of California, and twice the debt! ), raised its minimum wage to a whopping $15 per hour. Left-leaning lemmings were instantly filled with vim and vigour, proclaiming the minimum wage hike a social justice victory. Here, in no particular order, are a list of reasons Canada’s Liberal government is making a terrible mistake by raising the minimum wage. I got my first job in the summer of 2010. I was 17 years old, working as a lifeguard earning a generous (personally, I was very happy with it) $14 per hour. At the time, the minimum wage was around $10 per hour. I was making close to 50% over the minimum because prior to landing the job, I’d spent more summers than I can recall taking swimming lessons, as well as taking and completing first aid and lifeguarding courses. What do you think would happen if the bare minimum you’re legally allowed to pay an employee jumps up to $15? Naturally, lifeguards will also need a sizeable raise to maintain an incentive for people to expend the time and money on the required training. There’d be no reason to go through the trouble of becoming a lifeguard if you’re paid the same wage as a grocery store employee, who requires no prerequisite training, and has far less responsibilities. This also means that companies employing lifeguards will prioritize hiring and keeping people with experience. This logic applies to jobs across the board. What you’ve effectively done is price low-skilled and inexperienced workers entirely out of the labor force. Their new “minimum wage” is now zero. Youth unemployment in Ontario is higher than the national average. A recently published government jobs report showed that despite a slight January decline in national unemployment (5,700 less persons working than January of 2016), youth unemployment in Ontario was nearly 3 times harder hit (18,900 persons between 18 and 24 working in February of 2017 than in February of 2016). The Liberal government has a genius plan to address this. Make hiring unskilled, inexperienced young people more expensive! Origins of the term “Deep State” trace back to Turkey. The Turkish term “derin devlet” – deep state – referred to a cabal of government officials with off-the-record ties to various crime syndicates. Turkish politicians leveraged these connections to carry out state-ordered killings – among other dark deeds – in efforts to silence dissenting communist Kurdish insurgents. American pundits and politicians use the term “Deep State” to describe a coordinated effort amongst appointed (unelected!) government officials – in all branches of government – to undermine and undercut the democratically elected president. Leaking private conversations, memos and discussions in spades to whoever shares the vision of a Trump-free future (The New York Times and The Washington Post proceed to dislocate their shoulders, hyperbolically raising their arms screeching *me! *, *ME! *), these unnamed government officials attempt to erode trust and confidence in the Trump administration. Due to their unbridled enmity for all things Trump, liberal news outlets have effectively jettisoned any semblance of journalistic ethics, opting for the Shaun King route of reporting. Forget verifying sources, if it fits the narrative it must be true! And if you thought, “Finally! I can now see real reputable sources,” think again! The Reuters report says, “National Security Council officials have strategically included Trump’s name in as many paragraphs as we can because he keeps reading if he’s mentioned, according to one source, who relayed conversations he had with NSC officials.” One unnamed source (just one!) is used to back up inordinate assertions about the president.